CLAYTON, NC – On a steamy late-September afternoon, the Clayton Bootleggers finished off their pre-season warm up schedule with a victory over the New Bern River Raiders in a friendly match at East Clayton Community Park. The five 20-minute periods allowed both clubs to tinker with their lineups. It also allowed Bootleggers’ Head Coach Rich Munro plenty of playing time for his growing roster of charges. Many of which are new to the club and to rugby. 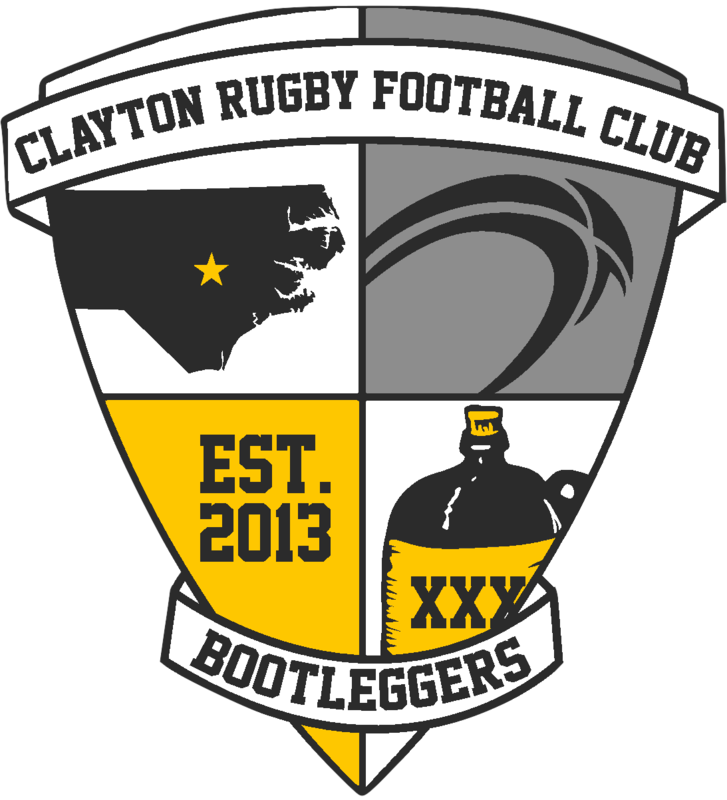 The Bootleggers started the match with fairly close to the lineup that will face off against Fort Bragg in their Carolinas D3 Conference opener in two weeks. The group started off slowly and a bit shaky. The clubs exchanged possession and also shared more than a few scrums. The Bootleggers found space to run early, but failed to capitalize due to lack of patience. The Bootleggers finally broke through around the 12 minute mark when a turnover at midfield went through the hands and found center Matt Aronowitz with space on the outside where he raced in for the first score of the match. Minutes later, a break from lock Ted Hardy led to a score for debutante Bootlegger wing Parker Slater to give Clayton a 10-0 lead as the first period ended. The 2nd 20-minute period showed more patience and improved ball retention from the Bootleggers as the home side starved New Bern of possession. Aronowitz scored his second try followed by tries from fullback Camron Grim, wing Wesley Smith, and Hardy. The barrage extended the scoreline to 36-0 in favor of the Bootleggers at the end of the 2nd period. Head Coach Munro opted to dip into the Clayton bench during the 3rd period with a number of subs hitting the pitch for some action with the 1st team. The Bootlegger’s defense remained strong and thwarted a few strong attacks from New Bern. The Clayton offense slowed in the 3rd period, although they retained a great deal of possession. Bootleggers’ Prop Jim Bartles accounted for the only score in the 3rd period when he crashed over from a few meters out to give the Bootleggers a 41-0 lead. For the 4th and 5th periods of the match, the Bootleggers 2nd unit came onto the pitch. The group, with a number of new Bootleggers making their debuts, produced an entertaining 40 minutes of back and forth rugby with New Bern. The 2nds poured in multiple tries in the 4th period with Devan Howard, Anthony Crumity, and Brian Anderson each scoring tries while the visitors could only manage one try. New Bern came back strong in the final 20-minutes, scoring five tries in the final frame. For the Bootleggers, Crumity and Anderson each added another try in the last period to close out an entertaining finish to a fun day of rugby in Clayton. 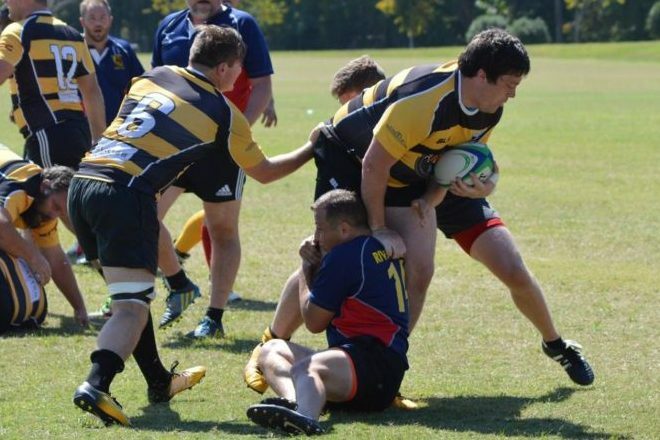 The Clayton RFC returns to the pitch on Saturday October 7th at home against Fort Bragg in a rugby double header. The clubs face off in a Carolinas D3 Conference match at 1pm with both clubs playing a 2nds/B-Side match immediately following. Admission is free and new fans are welcome to attend.